Adoptive immunotherapy using CTL has provided some clinical benefit to patients with metastatic melanoma. Use of cloned CTL of known specificity might improve clinical effect, but technical difficulties have limited exploration of this possibility. We have used fluorescence-driven cell sorting to clone tumor-specific CTL after staining with tetrameric MHC class I/peptide complexes. CTL specific for the melanoma Ags melan-A, tyrosinase, and MAGE3 were cloned from the peripheral blood, tumor-infiltrated lymph nodes, and skin metastases of five patients. Clones were isolated and characterized in as little as 6 weeks, much faster than is possible with previous techniques. We show that these CTL clones express markers compatible with immunotherapeutic use in melanoma, including the cutaneous lymphocyte Ag, which is associated with homing to skin. There is now considerable evidence that human tumors often express Ags that make them susceptible to lysis by CTL (1, 2). Despite substantial knowledge about the presentation of CTL epitopes in melanoma, it is still uncertain whether tumor-specific CTL can exert clinically useful effects in vivo. Some immunotherapeutic trials have reported limited success, although precise correlation of tumor regressions with CTL responses has not been possible (2), often due to the limitations of the CTL assays used. Now that a wide range of tumor Ags is available as immunotherapeutic targets, the adoptive transfer of CTL of known specificity has become a research priority (2, 3). Assessment of the clinical benefit from adoptive transfer of defined CTL will be invaluable in vaccine design, and also provide important new data on issues such as CTL homing to tumors and mechanisms of tumor resistance. We recently reported the use of tetrameric soluble class I MHC/peptide complexes (tetramers) to characterize melanoma-specific CTL ex vivo (4). We have also shown that CTL specific for one melanoma epitope could be separated from mixed CTL populations using tetramer-driven cell sorting (4, 5), and that such polyclonal CTL lines can efficiently lyse autologous tumor cells (4). Here we report generation of monoclonal CTL lines against three different melanoma epitopes using direct tetramer-driven CTL cloning. These CTL clones were suitable for use in adoptive immunotherapy and were derived in a time frame appropriate for patients with rapidly progressive disease. Fluorescent tetrameric HLA-A2.1/peptide complexes were synthesized as previously described (5, 6, 7) using peptides synthesized by FMOC chemistry: “A2/melan-A” ELAGIGILTV, “A2/tyrosinase” YMDGTGMSQV, “A2/MAGE3” FLWGPRALV (1, 2, 4). The clinical characteristics of the patients studied (all with histologically confirmed malignant melanoma, and HLA-A*0201 by PCR) appear in Table I⇓. Cryopreserved PBL from patient L02 were thawed and cultured overnight in Iscove’s medium plus 5% human serum, before sorting. Cryopreserved PBL from patient DECH were thawed and pulsed with 10 μM A2/MAGE3 peptide in CTL medium (Iscove’s medium, 5% human serum, IL-2 100 U/ml) plus IL-7 10 U/ml, then cultured for 2 weeks before sorting. Patients MM14 and MM18 had tumor-infiltrated lymph nodes (TILN)3 removed from the left and right axillae, respectively, which were mechanically disrupted and cultured in CTL medium plus IL-7 10 U/ml for 14 days (MM14) or 23 days (MM18) before sorting. Patient MM15 had a skin metastasis excised from the left shoulder, which was mechanically disrupted and cultured in CTL medium for 13 wk, when lymphocytes were stimulated with PHA 5 μg/ml and expanded for 2 more weeks before sorting. Cells were stained with PE-labeled tetramer for 15 min at 37°C before addition of Tricolor-anti-CD8 (Caltag, Burlingame, CA) for 15 min on ice, followed by extensive washes and analysis on a FACSVantage (Becton Dickinson, Mountain View, CA). 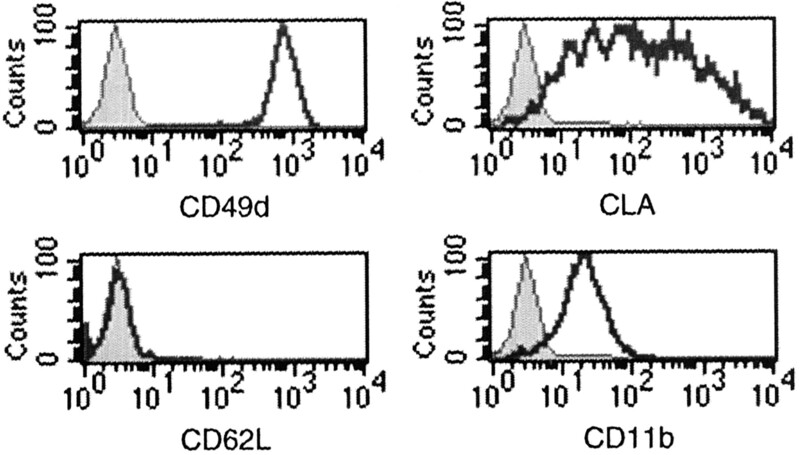 Small lymphocytes were gated by forward and side scatter profile, before cloning according to tetramer/CD8 double-staining, using the gates shown in Fig. 1⇓. Single cells were sorted directly into U-bottom 96-well plates, previously coated with anti-CD3 and anti-CD28 both at 100 ng/ml in PBS, containing 105 irradiated B cells in CTL medium plus IL-4 20 ng/ml. Cloning plates were incubated at 37°C in 5% CO2 for 10–14 days without any manipulation then proliferating clones were expanded in CTL medium, followed by restimulation using PHA 5 μg/ml with irradiated allogeneic PBL and B cells as feeder cells (108 PBL and 2 × 107 B cells for bulk expansion). FACS profiles of patient samples during tetramer-directed cloning. Samples from patients as described in the text were stained with anti-CD8 and tetramer as marked on each panel. In each plot, the sorting gate used to clone double-positive cells appears as a rectangle in the upper right hand quadrant, and the percentages of small lymphocytes falling within this gate, and within the upper left and upper right quadrants, are shown. We synthesized three fluorescent tetramers capable of labeling melanoma-specific CTL, including a tetramer not previously reported which stains A2/MAGE3-specific CTL. All tetramers stained appropriate clones brightly (4), and no nonspecific staining of cloned CTL was observed (data not shown). In patient samples from three different tissue sources, tumor-specific CTL could be identified for cloning by tetramer staining either ex vivo or after short periods of tissue culture. Tissue culture of the TILN from patient MM14 revealed the presence of both A2/melan-A and A2/tyrosinase tetramer+ CD8+cells (Fig. 1⇑, A and B), at frequencies similar to those previously observed in other patients (4). Cultured TILN from patient MM18 had a significant population of tetramer+CD8+ cells for A2/melan-A only (Fig. 1⇑C). Patient L02 had readily detectable A2/melan-A+CD8+ cells in the peripheral blood (Fig. 1⇑D), at a frequency similar to that seen for influenza-specific CTL in normal subjects (5). Patient DECH had no cluster of A2/MAGE3+CD8+ in PBL on direct analysis, but such cells could be detected 2 weeks after a single pulse with peptide (Fig. 1⇑E). Patient MM15 showed very few CD8+ cells in the PHA-stimulated culture from a skin metastasis; however, a very high proportion of these stained with A2/melan-A tetramer (Fig. 1⇑F). CTL were cloned directly from the tetramer+CD8+ populations. Cloning plates were preincubated with anti-CD3 to provide a solid-phase mitogenic signal, and also with anti-CD28 in case clones were capable of receiving costimulation through CD28. Between 2 and 13% of sorted clones (average, 6.5%) expanded sufficiently to cryopreserve and characterize (Table I⇑); 35 of 36 expanded clones (97%) subsequently stained with tetramer or proved peptide specific in chromium release or enzyme-linked immunospot analysis (Table I⇑). Hence cloning of specific CTL using tetramer-directed sorting was extremely efficient, in marked contrast to previous cloning methods, where the vast majority of clones expanded are not specific for the epitope required. No clear differences in cloning efficiency between the different source tissues emerged, although the peptide-stimulated culture required the greatest number of starting lymphocytes to generate each clone (Table I⇑). All 10 tetramer+ clones tested in chromium release assay recognized the relevant peptide epitope efficiently at low E:T ratios (a representative assay using two different clones is shown in Fig. 2⇓). 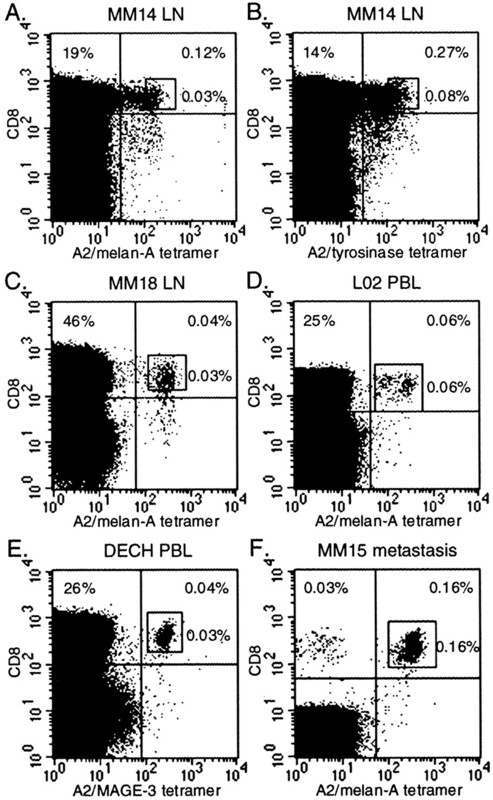 Melan-A and tyrosinase-specific clones also recognized tumor cell lines expressing the appropriate Ag, indicating they were of sufficiently high affinity to recognize small numbers of MHC/peptide complexes (Fig. 2⇓). All five clones tested also specifically released IFN-γ in response to both their cognate peptide and appropriate tumor cells (data not shown). 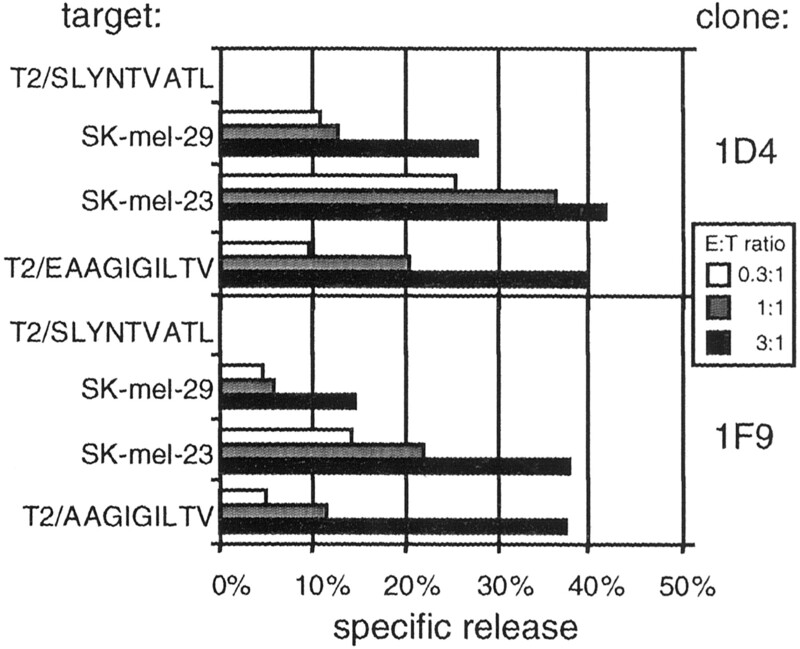 Specific killing of tumor cells by CTL clones expanded after tetramer-directed cloning. Two CTL clones, 1D4 and 1F9, derived from patient MM14 by sorting with A2/melan-A tetramer, were tested in standard 4-h chromium release assay for their ability to lyse HLA-A2.1+ melanoma cells expressing melan-A (SK-mel-23 and SK-mel-29) and HLA-A2.1+ T2 cells pulsed with A2/melan-A peptide (EAAGIGILTV), the A2/melan-A nonamer (AAGIGILTV), or the negative control A2/HIV-gag peptide (SLYNTVATL). Clones generated by this technique are likely to be useful for adoptive immunotherapy. Bulk expansion of clone 1F10 (a melan-A-specific clone from patient MM14) in standard tissue culture facilities showed yields per clone could reach 2 × 109, sufficient for an infusion of potential therapeutic benefit (3). The practicalities of tetramer-driven cloning recommend the technique in this context. Due to the high cloning efficiency, it would be possible to rapidly generate very large numbers of tumor-specific clones from any of the patient tissue sources typically available. We generated up to 7 tumor-specific CTL clones from 105 small PBL (patient L02), so tens of clones could be generated from as little as 1 ml of blood in similar patients. In addition, cloning CTL is no longer a prohibitively lengthy procedure in the context of advancing metastatic disease. It is also important that clones of two specificities were readily isolated from one patient (melan-A and tyrosinase-specific clones from patient MM14). Since antigenic heterogeneity and Ag loss tumor variants may arise in melanoma, adoptive immunotherapy with CTL specific for multiple epitopes is likely to be advantageous. The use of more tetramers, including tetramers from class I molecules other than HLA-A2.1 (already well-characterized in other systems), will make adoptive immunotherapy targeting multiple epitopes feasible, improving the prospects of significant clinical impact against heterogeneous tumors. Nevertheless, metastatic melanoma represents a formidable target for adoptively transferred CTL, and exerting any significant clinical effect may require far greater numbers of cells than have proven effective against viral infections (3). Future work will determine whether tetramer-directed cloning can generate sufficient CTL to successfully address this challenge. The advantages of using clones for immunotherapy rather than polyclonal lines include the complete assurance of Ag specificity and the ability to profile individual clones for their likely homing behavior after infusion (8). Surface phenotyping of selected clones confirmed all were CD8+TCR-αβ+ as expected, and CD45R0+ CD45RA− CD44+ (data not shown) CD62L− (Fig. 3⇓), consistent with previous antigenic stimulation. Lack of CD62L suggested such clones infused during immunotherapy would not home to lymph nodes via high endothelial venules but would rather traffic through the peripheral circulation. Clones tested also expressed CD11b and CD49d (Fig. 3⇓), consistent with cells capable of migration through activated vascular endothelium expressing VCAM-1, which is associated with metastatic melanoma (9, 10). A minority of clones also stained for the cutaneous homing marker cutaneous lymphocyte Ag (CLA) (Fig. 3⇓), suggesting that clones could be selected that would or would not home to skin after infusion (7, 11). It may be possible to preselect clones for immunotherapy according to their homing markers, by triple-staining for surface molecules such as CLA before cloning (7). Similarly, clones with the strongest proliferative potential might be preselected by sorting only tetramer+ cells that also express markers such as CD28 (5). Surface phenotype of a tumor-specific CTL clone expanded after tetramer-directed cloning. CTL clone 1F10, derived from patient MM14 by sorting with A2/melan-A tetramer, was phenotyped for surface markers after expansion and confirmation of its specificity for the A2/melan-A epitope. Similar expression of CD62L, CD11b, and CD49d was seen in all other clones tested, but the expression of CLA shown here was seen only in a minority. Finally, it has been proposed that magnetic beads coated with MHC-peptide complexes may be capable of sorting human CTL for adoptive immunotherapy, whereas flow cytometry is too technically limited for this task (12). Here we have demonstrated that tetramer-driven FACS sorting is indeed a practical method for generating large numbers of tumor-specific CTL clones from commonly available patient samples. We thank Dr. David Propper and Professor Adrian Harris of the Imperial Cancer Research Fund Clinical Oncology Unit, Oxford, U.K., and the staff of the Plastic Surgery Unit at the Radcliffe Infirmary, Oxford, U.K., for clinical assistance. ↵1 Work was supported by funding from the Girdlers Company, London, the Cancer Research Campaign, and the U.K. Medical Research Council. ↵3 Abbreviations used in this paper: TILN, tumor-infiltrated lymph nodes; CLA, cutaneous lymphocyte Ag.